“I thought you were a truck!” The old timer called out surprised, and no doubt a bit confused, from the thin woods that bordered the gravel road. “Nope, just a guy on a bike.” I called back. “Have a good morning…” He watched me whiz by, my bike rattling down the bumpy two track. His confusion was understandable. 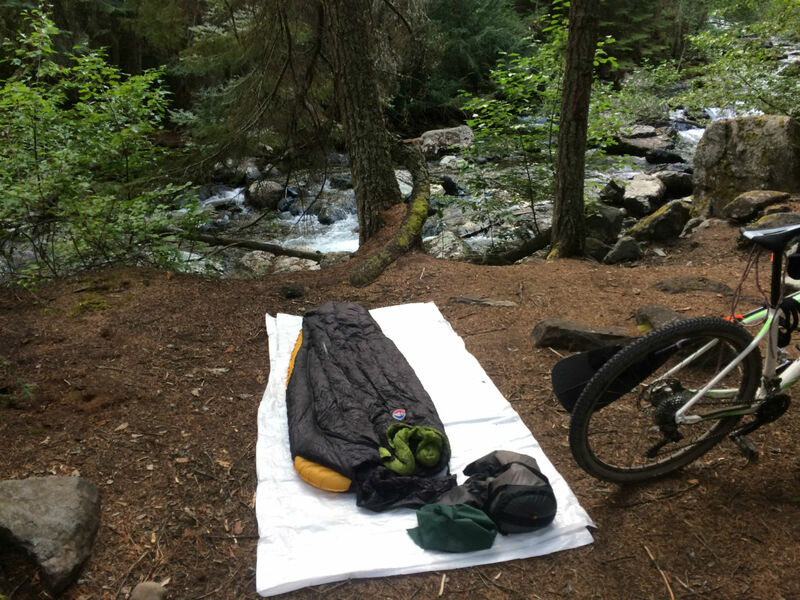 I was an odd sight: an old, forest green Thermarest sack bulged beneath the crossbar of my mountain bike; a 10L NRS dry bag dangled from my seat; an ultralight sleeping pad bounced from my handlebars. 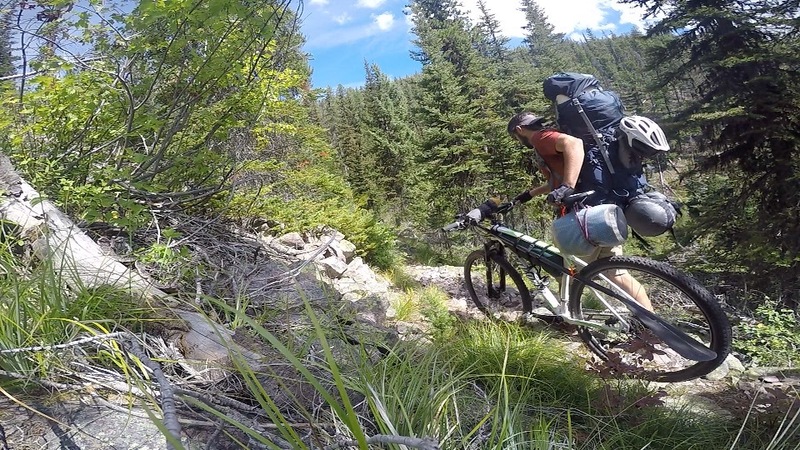 Atop this two-wheeled mechanical beast of burden, I shouldered a massive blue backpacking pack with a six-foot-long paddle erupting from the top. I wasn’t something one would expect to see on a little-used logging road on a quiet Sunday morning in mid-August. “I guess my pack really is that big,” I chuckled to myself. It was the second time in less than 24 hours that I’d been mistaken for a truck. I am a bit of a map addict. I’ll admit it. I often find myself spending an entire evening shifting around the kitchen table, counting contour lines and scheming about my next adventure. 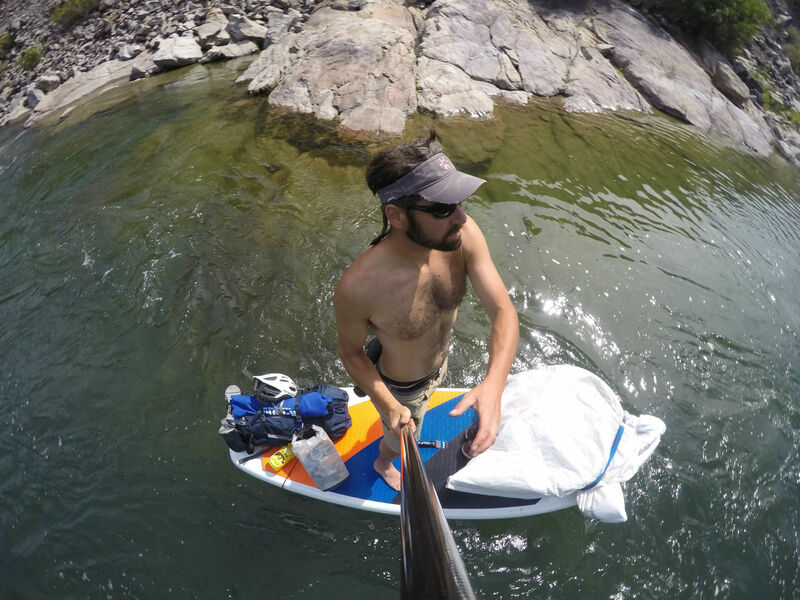 I also love combining sports, and I had long wanted to do a multi-day bike and paddleboard trip. Fifteen years ago, when we first started canoeing, my wife and I rode bikes between our various put-ins and take-outs, thoroughly enjoying both the pedal and the paddle. 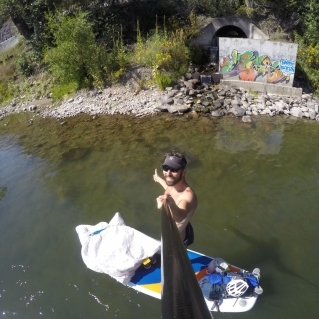 On solo SUP missions, I often toss my deflated paddleboard into a hand-me-down kid hauler and ride back to the car. 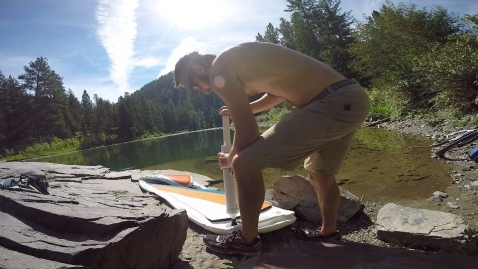 But I wanted to do something bigger; I didn’t want to simply ride up a river valley, throw my board in the water and float back. I wanted to do a loop trip, leaving from and returning to my house. And I wanted to do the entire thing under my own power. Fortunately, I live in Missoula, Montana, uniquely surrounded by accessible public land and rivers perfect for biking and paddleboarding. One June night, late into a map-geek-session, I found the perfect route. 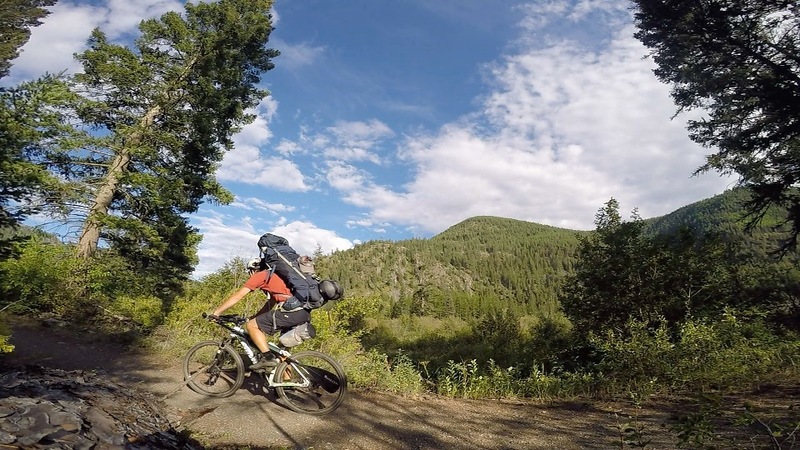 I’d start at my house, ride up through the Rattlesnake National Recreation Area north of town, summit Mineral Peak and drop down through the Gold Creek drainage to the Blackfoot River east of town. Then I’d simply paddle back home. All I’d need to do was “ride” my bike 40 miles. Then paddle 20 miles. In 50 hours. With all my gear. For some reason, none of my usual adventure partners wanted to join me, evidence, perhaps, that my plan was a bit hare-brained. But I had trip fever and if it was to be a solo adventure, that was fine with me. When a weekend in mid-August opened up, I went for it. I bailed from work at noon on Friday, buzzing with pre-trip excitement. 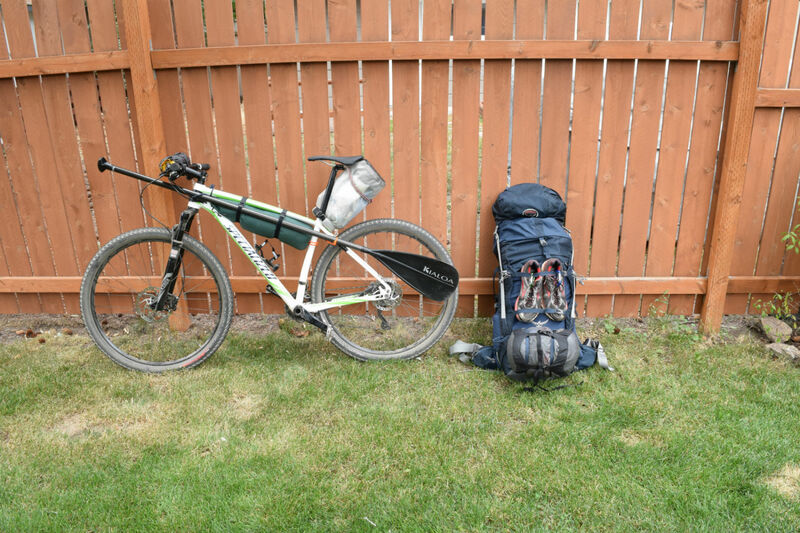 My gear was packed; my bike was loaded; my nerves a tangled mess. I banged out a few chores and began methodically reviewing my gear. Bear spray, water purification tablets, extra tubes, bike pump, board pump, paddle, sheets of Tyvek, food, GoPro—all checked and checked again. 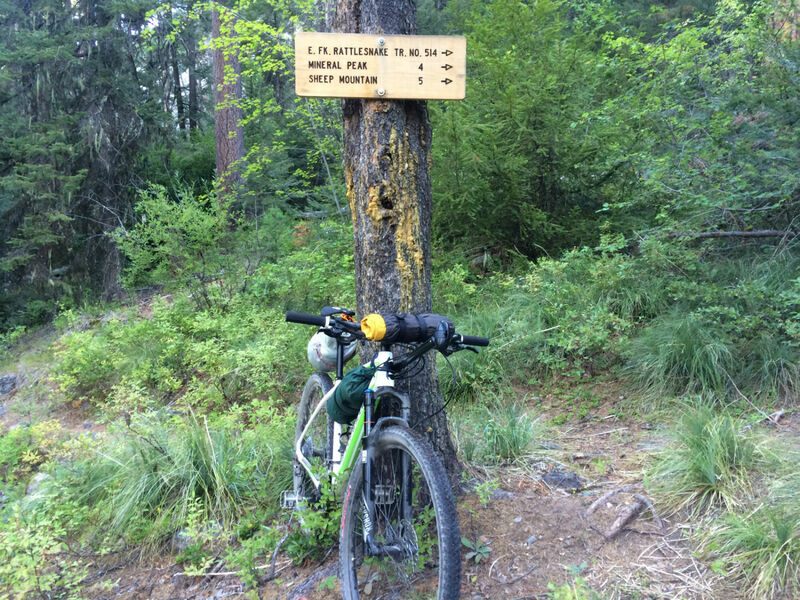 At 4:30 that afternoon, I rolled out of the driveway, clicked into my pedals and started spinning toward my first night’s destination—Franklin Bridge, about 15 miles away, deep in the Rattlesnake National Recreation Area. Four hours later, I rolled across simple concrete span, stepped off my bike and mentally thanked my friend Aaron who sagely suggested I wear two pairs of bike shorts. The evening was spectacular: warm but not hot, with a gentle breeze that kept the mosquitoes at bay. I found a campsite yards from the cold rush of Rattlesnake Creek and boiled water for my dehydrated dinner. The August daylight stretched into evening, yielding without protest to a soft dusk that backlit the Pacific yew, cedar and doug-fir trees surrounding my camp. To save weight and space, I’d left my tent at home. 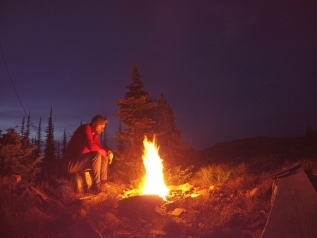 Around ten, I slid into my sleeping bag, tired but comfortable, as the smoke from a family camping nearby curled up the valley. Dusk finally turned to dark, and the night’s first stars began twinkling between the canopy above me. Morning dawned cool and soft. I slipped into my thin down jacket and made coffee. 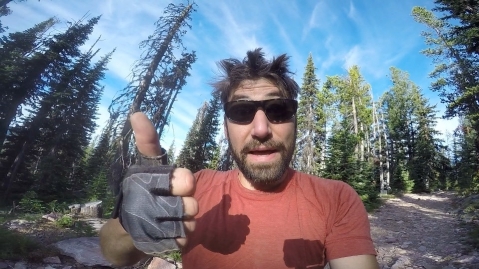 Despite the fact that I’d taken the advice of my campsite neighbors and hung my gear from a tree, pack rats had chewed the brim and band of my visor. Fortunately, it seemed like the salt-encrusted visor diverted them from more important gear. I didn’t linger, but I didn’t rush either. The day’s push loomed as heavy as my loaded pack: 3,000 feet of elevation gain over six miles of tight, rocky singletrack. I didn’t expect I’d be biking much, if at all, but the promise of the following day of downhill riding and paddling beckoned. At 9:15, I waved goodbye to the family camping nearby and started pushing my bike up the road. In 15 minutes, I turned off onto the East Fork of Rattlesnake Creek Trail, which I would follow to the road that led to the Mineral Peak lookout tower. Rocks and roots littered the narrow trail. I slipped, stumbled, and pushed my way up the small, verdant valley, each step a fight against gravity. Abundant huckleberries proved a critical mental and physical boost. Every few minutes, I’d pause, catch my breath and gratefully shove a handful of the earthy, delicious berries into my mouth. Revived, I’d push on another five or ten minutes and repeat, the perfect purple globes powering my climb. I was worried about water. Just before shouldering my pack at the campground, I realized the visor hadn’t been the only pack-rat casualty. A few tiny holes in the top of my brand-new three-liter Camelback dripped water onto my back. If I bent over, as I did when I sought huckleberry salvation, the drips grew more intense. The map showed that the road I would descend the following day crossed a creek, but in mid-August, I wasn’t confident it would be running. Rationing water was critical. But so was staying hydrated. I assured myself that I had enough to get to the river, where I could treat some more. Leaking Camelback or not, I wasn’t turning around, so with each thirsty step, I inched closer to Mineral Peak. 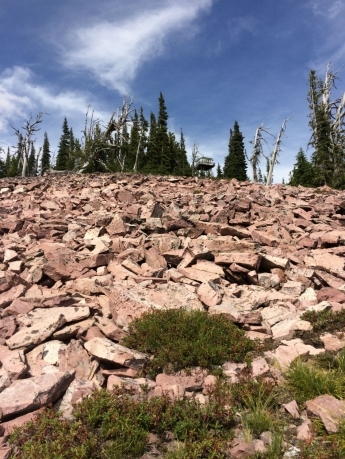 The trail demanded attention; jagged rocks erupted from the tread at every step. Forced to split my focus between steering the bike’s front wheel around the rocks, and watching where I put my feet, I spent most of the day staring down at the trail. If the wheel hit a rock, the bike stopped, requiring an extra grunt to get going again. The narrow, rock-littered trail didn’t provide quite enough room for both the bike and my feet, so I was constantly slipping off the trail or tripping over rocks, shrubs or roots. When I finally intersected the road that would take me to the summit of Mineral Peak, I whooped, hollered and nearly jumped up and down. 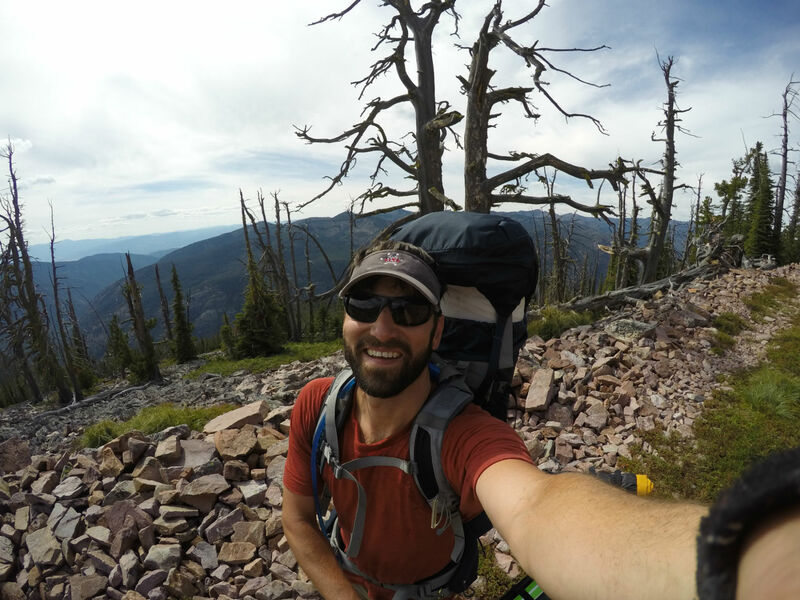 My 35-pound pack kept me grounded, but my flagging energy got a small boost even as I took a closer look at the “road.” I had hoped to get back on the bike and ride the last couple of miles to the summit, but the rock-strewn road was too steep. I resumed my tortoise-like progress. At least the two-track road allowed me to walk along beside my bike, a welcome change from the narrow trail. After a half hour or so, I heard the rumble of an engine below me. I veered off the road and waited for whomever it was to pass. “Is that a truck?” I heard the voice before I saw the massive Forest Service truck bouncing up the road. A four-person crew rumbled by. They stopped long enough to explain what they were doing and offer a ride. I declined the ride and resumed my plodding ascent. 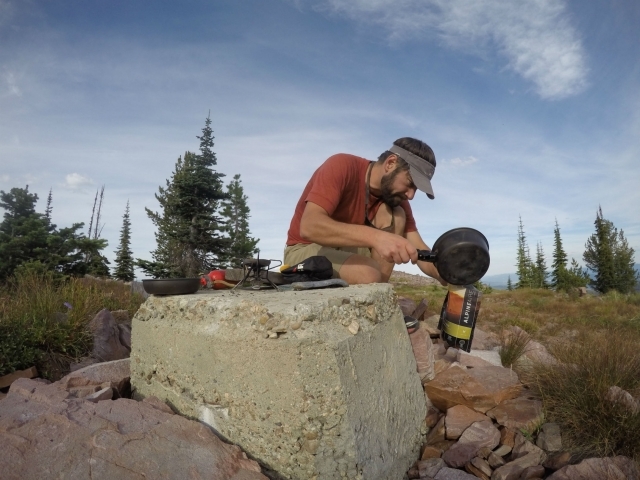 When I caught up with them at the summit, they immediately offered me water— blessedly cold, straight from an ice-filled cooler in the bed of the truck—I gratefully accepted and chugged a few bottles immediately, stashing the remainder in the shade. Once their saws were sharpened and their water supply reduced, they headed back down the road, leaving me with only the lookout tower, a few flitting birds and buzzing yellow jackets as company. Mountains spilled out in each direction. 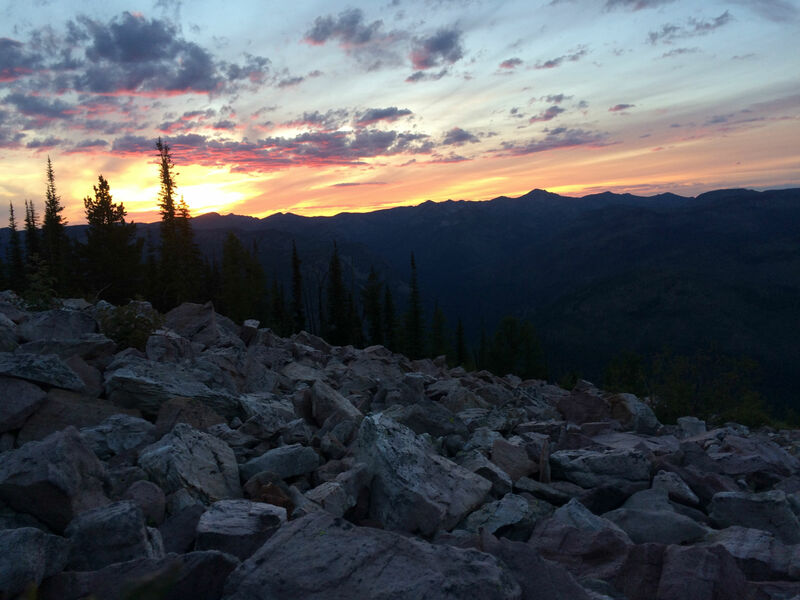 To the west, the craggy peaks of the Rattlesnake rose to meet the sun slowly dropping through the clear Montana sky. To the north, the Mission Mountains revealed late season snowfields, still white against grey rocky summits. The Swan Mountains rose to the east, jagged sawblades cutting across the horizon. The steep, rocky Bitterroots and the rolling Sapphires stretched south, leading all the way to Idaho. I spent the afternoon jotting notes, stretching my tired back and exploring the summit. The final hours of the day drifted by while the sunset painted the mountains and sky a kaleidoscope of pink, orange, rose, purple and inky blue. 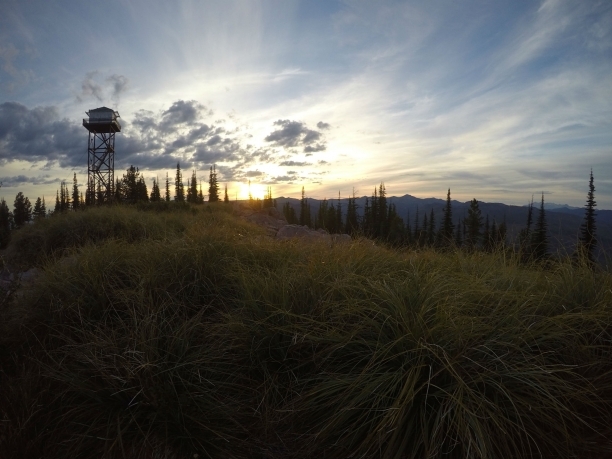 Once the last of the golden-rose alpenglow faded from the mountain peaks, I lit a small fire and watched the shadows play on the lookout tower. Sunday morning dawned early and I rose with it. By 7:30, I was walking back down the rock-littered two track, making my way carefully, toward the valley bottom. Walking proved safe, but slow. Feeling rested and ready to rip, I mounted my bike much earlier than I had planned and commenced to bounce over the rocks and ruts. It was exciting but tiring. My heavy pack and the bouncy road forced me to stand on my pedals, my arms and legs acting like over-worked shock absorbers. I was breathless in a minute. I was also pushing my limits. It wasn’t long before I hit a rock too big to ride over and hurtled over the handlebars onto the dusty ground, my bike laid out behind me. Miraculously, I popped up with a just a few scratches on my arm and dusted myself off. Humbled and wary, I resumed walking. The road eventually smoothed and grew wider, and I remounted my bike. A golden morning light colored the valley. I went faster and faster. The descent was exhilarating and made all the slow, monotonous grinding of the previous day completely worth it. And I still had a gorgeous paddle waiting for me. My smile was bigger than the grill of an F-150. Even if I had fun letting loose on the descent, it wasn’t without incident. My crash, some unforeseen uphill walking, a derailed chain and a hasty duct-tape-repair-to-the-shifter made my downhill progress slower than I had hoped. 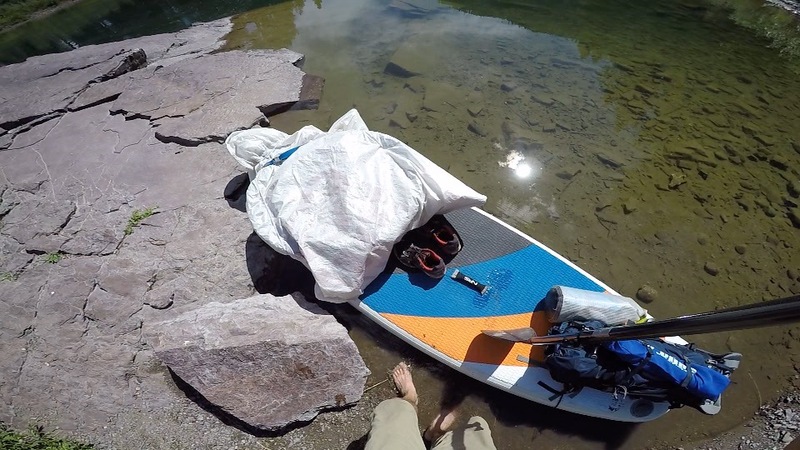 Despite having left the summit at 7:30, it was 11:30 before I had made it to the river, broken down my bike, inflated my board and repacked my gear. I wrapped the pedal-less bike frame in a sheet of Tyvek, stacked the wheels and then wrapped everything again in another sheet of Tyvek. I ran a cam strap around the package and, using the length of bungee I had tied through the D-rings, I fastened it to the nose of my board. I tossed my camping gear into a dry bag and stuck that in my hiking pack before tying it to the back of the board. There wasn’t much room between the bike on the nose and the pack on the tail, but enough where I could kneel should the need arise. Thus loaded, I shoved off into the Blackfoot’s steady current. If you’re at all familiar with fly-fishing or Brad Pitt, then you’ve likely heard of Montana’s Blackfoot River—Norman MacLean ensured the Blackfoot’s position in western mythology with his novel A River Runs Through It. Less well known is the fact that until recently the Blackfoot was effectively dammed at its confluence with the Clark Fork River, just six miles upstream of downtown Missoula. A fascinating story of environmental catastrophe and redemption resulted in the removal of the Milltown Dam, which had sat at the confluence of the Clark Fork and the Blackfoot Rivers since 1908. 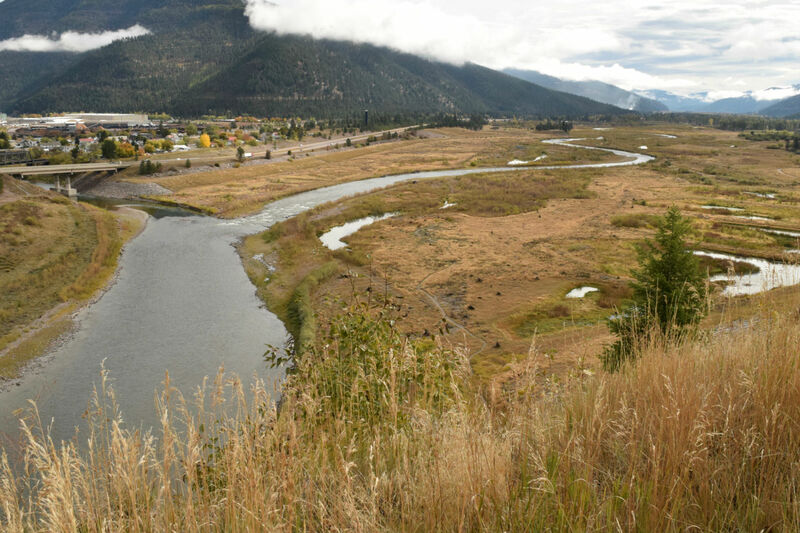 The super short version: In 2008, the dam was taken down; by 2010 the Clark Fork was flowing in its historic channel; and in 2014, officials opened the confluence to recreational boating. For the previous century, floaters were required to stop at the take-out a few miles upstream of the confluence, making a trip like mine literally impossible. 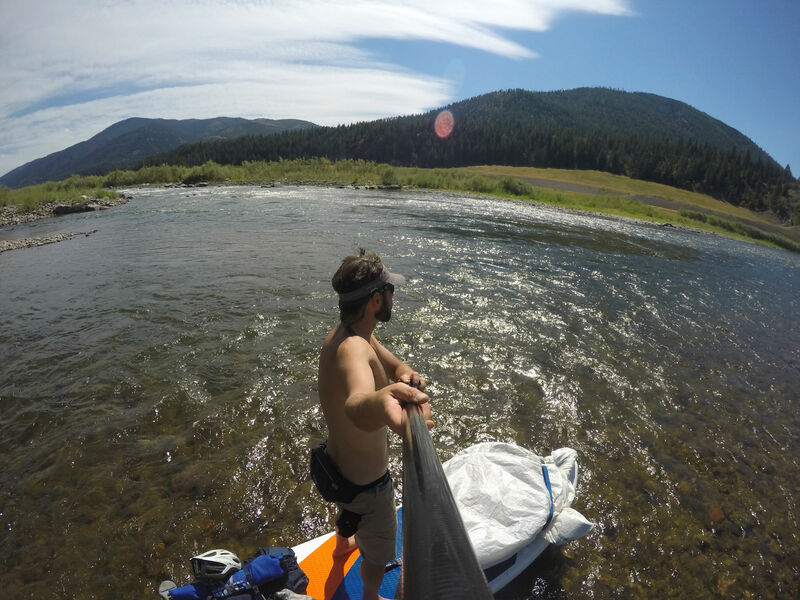 I was one of the first paddleboarders to legally float from the Blackfoot to the Clark Fork in 2014, and that afternoon, I would once again pass onto the Clark Fork. The upper river was remarkably quiet. I passed a few floaters here and there. 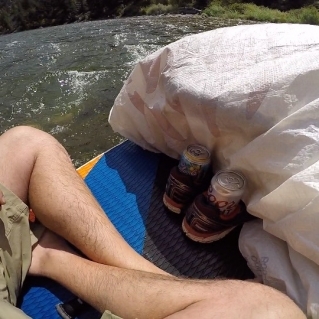 Shortly after 1:00 pm, a couple of fisherman who had “had a few too many the night before” gave me two beers just before they pulled off the river. I’ve never drank a Coors Light that tasted so good. But as I got closer to town, river traffic increased. And then exploded. The lower river was packed. Regattas of tubers. Rafts with a half a dozen screaming kids. Dogs on laps of girls on tubes. I cruised on through the scrum, making time as the sun baked my bare back. Most fellow floaters wanted to know what was in “the bag.” The way the bike frame and seat were arranged on the board, it looked kind of like a body bag with arms and a head poking out. I got a lot of laughs telling people it was my trip partner who didn’t make it. When I told folks what I’d been doing, they were invariably stoked. Like the huckleberries from the day before, their vicarious enjoyment of my adventure gave me a boost when I needed it most. I was feeling the weekend. My arms and legs were tired from the biking and hiking. I kept hoping someone else would give me a beer, but no one did and I was too shy to ask. I made decent, if beer-free, time through the widening river as I floated past grey and orange cliffs dotted with doug-fir and rocky mountain maples. 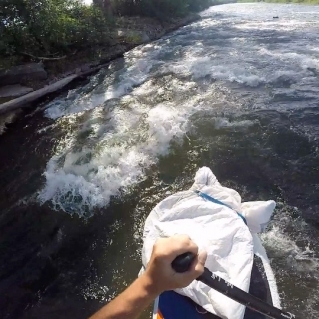 I paddled steadily and by 4:00 pm, I hit the confluence of the Blackfoot and the Clark Fork. By 5:15, I was floating through town. As I approached Brennan’s Wave, smack in the heart of Missoula’s downtown, I heard thunderous music from the shore. It took me a moment, but I realized the Missoula Symphony was practicing for its annual “Music in the Park” concert that evening. The unmistakable theme from Star Wars leapt across the water, and I succumbed to the drama, feeling like a triumphant Jedi Knight returning home to his peaceful watery planet. At the time, it felt like a fitting finale to my adventure. Fifteen minutes later, I zipped through the final rapid and made my way to the takeout, just a few blocks from my house. I spent thirty minutes putting my bike back together and deflating my board. With my board awkwardly under my arm, I pushed off one last time and rolled back to my house. No one mistook me for a truck as I pedaled the last couple of blocks through my neighborhood. I’ve biked to Franklin Bridge plenty of times. I’ve camped in the Rattlesnake too. I don’t even remember how many times I’ve paddled that stretch of the Blackfoot or floated through town on the Clark Fork. But I’ve never done them all together in one trip. I was proud when I rolled into my driveway and past my car, dusty from a weekend of disuse. 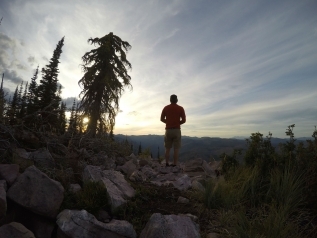 I felt that deep sense of achievement that comes from completing an ambitious trip. The last 50 hours had all the parts of a good adventure: moments of rest and moments of real physical challenge; times of worry and doubt tempered by successes and confidence; solitude and self-reliance balanced by brief friendships and offers of help; and, perhaps the most important of all, simple moments of pure unbridled joy.